We've Chosen Our Birthday Party Theme, Now What? You've chosen a theme for your child's birthday party and often things get hectic at this point. You frantically try to gather everything that you need and often activities is the last (and most dreaded) portion of your planning. What in the world can you play and do at a party with such a specific theme? First, let's talk about how many activities you should have planned. One important thing to remember is that it's always better to OVER plan than to under plan. There's nothing worse than a bunch of children with nothing to do. So have a couple of extra games stashed away that you can whip out in case of rain, or if the games just move quicker than you anticipated. On the same note, however, don't OVER plan your party. Children enjoy "free time" to just do whatever they wish, as well. I recommend having 3-4 activities planned. More than that and typically kids are "activitied out." Two party games that are always a hit are a treasure hunt and the "old reliable" Pin the Tail on the Donkey. I have never used a donkey, though, and always tie it directly to the party theme. For instance, if you're having a Wow Wow Wubbzy party, have your favorite designer create a poster sized Wubbzy, without the tail, of course. 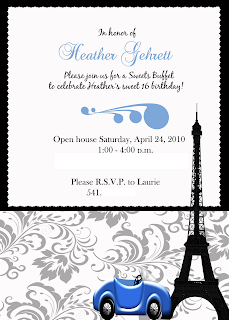 If you're planning an Ooh La La, Day in Paris party, use a poster of the Eiffel Tower and have the party goers pin a picture of your guest of honor in front of the tower. It just takes a little bit of creativity and you can make it work and still have all of the laughter and fun and that goes along with this great activity. The treasure hunt is easy enough to tie into your theme, if it's a Blue's Clues party, mark each area with a blue paw print, etc. This is also a great way for kids to pair up in groups. Even though it's not intended to go that way, it always happens, so be sure to leave a large enough treasure that each of the guests will get a share. and send the kids on a fact finding mission. Of course the child(ren) at the end of the mixer with the most answers is the winner. Or, if you don't have time to write and print the list, consider playing the Liars Club - where each person makes three statements about themselves. 2 statements are true, 1 is a lie. This is very fun because many people have done things that sound untrue. Everyone tries to guess. There are many resources on the internet to help you plan your activities. One of my favorites is partygameideas.com. This site is very well organized for indoor vs. outdoor, has games for very young players and even has Bible games listed. If you have questions or comments, please feel free to post. I'd be happy to help you in any way that I can. Heather aspires to go to Paris after graduation, although her Daddy has his own ideas about that. You know how Daddy's can be, but, that's a whole different story. It just so happens that my sister-n-law is an AMAZING confectionist and she makes the most beautiful things that you'll ever eat, so they decided to have a Sweets Buffet Open House from 1-4. It was a fantastic idea, since so many kids this age have sports or band practice, or other obligations on Saturdays. By having the Open House, no one felt pressured to be on time, or worse yet, missed the party altogether, since they were already an hour late. From 1-4, at any time, those that know and love Heather were invited to come and enjoy some time with her and wish her a Happy Birthday. I made Heather's party invitations, the bag tags, thank you cards, and envelope seals as my gift to her. Laurie, Heather's mom, made all of the sweets for the buffet and it turned into one of the most beautiful parties that I have seen. I couldn't resist sharing with you some of the photos. 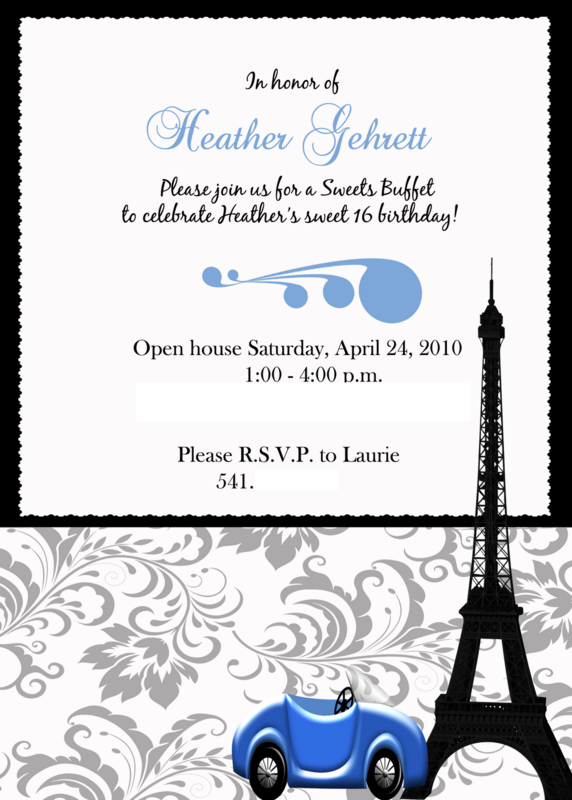 Here are her invitations, check out the poster in the third picture, this is what we built the theme from. These were her gift that I took to the party. I made her Thank You cards/stationery/note cards and envelope seals. I coupled them with a Cross pen. It made for a great gift. Isn't this just gorgeous? It was almost (ALMOST) too pretty to eat...but YUMMY! Awesome Eiffel Tower cookies and pretty bag toppers, make for GREAT party favors. Don't like cookies? WHAT? Don't like cookies...(weirdo.) No worries, we've got caramel corn. So anyway, the whole point of this posting is that you don't have to be a millionaire to have a super sweet 16 party for your daughter/son. No super stars, no limousines, no second mortgages. Let her/him be the super star...and the best news of all is that you can satisfy your sweet tooth! Yay! It's time to plan another birthday. No, seriously, I mean it...Yay! What fun!!! Planning a child’s birthday party doesn’t have to be stressful. Every child loves their birthday...next to Christmas, it's the “most bestest “ time of the year, as my little one used to say. Their excitement begins building oh, about 7 months before the party, that is, if they can hold out that long from planning the next big bash. But, my, my, the look on their little faces on party day is truly something to cherish. We, as the official party planner and coordinator, however—well, let’s just say that we are slightly less excited. Am I right? I mean, we definitely want our child’s birthday party to be the perfect new beginning to the next year of his/her life, but geeze, there’s so much to do: choose a theme, order invitations, write them out, send them, plan activities, order the cake, buy the favors, get the party supplies, and on and on and on. How—how – how will we EVER get it all pulled together and make sure that it’s perfect for our little one? I’m here to tell you, RELAX! It doesn’t have to be “perfect.” It can actually be as fun for you as it is for your little tyke. As far as I’m concerned, it’s a successful birthday party if no one bursts into tears (including you) and everyone has fun. The next several posts will be dedicated to planning your child’s birthday party. I will be covering everything from a-z for your party planning. I hope you will find this series refreshing and helpful, but most of all FUN! So, first things first, choosing a theme. Now, depending on the age of your child, this could be simple…or not. As we all know, as children get older they get much more indecisive and cute cartoon characters are just not “cool.” It takes some creativity on our part, but putting some thought into it will definitely pay off in the end! Pretty much anything can become the theme of your party. What does your child like? What does s/he want to be when s/he grows up? What’s his or her favorite activity? Favorite TV show or character? Favorite Game? Even a favorite color can be a party theme… and make it very simple. What about a purple people party? Or, will it be a glamour make-over party, a skateboarder’s party, a “down on the farm” party? How about a Rock Band party or a Wow Wow Wubbzy party? Candyland? What about a sweets buffet? Make a list, discuss it with your child, and then use your imagination. Don’t stress—and please, please just HAVE FUN! To help you in your search for party favors, here's one of my favorite Etsy shops. New Beginnings - How Exciting! This blog is all about new beginnings, whether it be the beginning of a new life through the birth of a new little one, a new life together, as a married couple, or the beginning of a new year after a recent birthday. I will share with you here some of the best of what Etsy offers, along with tips to aid you in planning the perfect NEW BEGINNING! For those of you who may be unfamilar with Etsy, it's a delightful marketplace that provides new beginnings, or opportunities, for individuals and their handmade crafts. Etsy is also a wonderful, wonderful resource for consumers to find anything that you can dream up. If it's not already listed, there's certainly an Etsy artist that will happily create it for you! I am a SAHM Mommy of two wonderful little ones and after 15 years of working outside the home, as an Activities Director and Service Coordinator, I returned to school two years ago and am a full time college student at DeVry University. I am studying Graphic and Web Design and I LOVE my new beginning. When I am not designing or spending time with my family, I enjoy scrapbooking...the old fashioned, paper and scissors way, playing my Nintendo DS (yes, I'm somewhat of a gamer; nerdy, I know. ), and going to the Oregon coast. I also enjoy shopping, but what woman doesn't?! I LOVE a good sale -- my fiance tells me I'm going to save us right into the poorhouse. LOL. And, I love to search Etsy's pages for new and unique handmade items, which....lead me here, to this blog.